The concept of The New Creation began sometime during 1973 when Robert Randle penned the song “The Fish Song” (credited as Robert 51-X). “The Fish Song” was recorded as a salute to the door to door Nation Of Islam fish sellers (Whiting H&G). With William Cooper taking the lead on the b-side “Elijah Knows” (a tribute song to Elijah Muhammad, the late leader of the Afro-American political and religious movement, The Nation Of Islam). Adding teenage cousins Melvin Houston (Bass Guitar) and Keith Randle (Conga drums) and Wayne E-2X on vocals, The New Creation began performing with other high profile supporters of The Nation Of Islam such as heavy weight boxing champion Muhammad Ali, supporting his Celebrity Boxing Promotion Tours. They also shared the stage with other soul groups Philadelphia’s The Delfonic’s, L.A’s own The Young Heart’s and New York’s Kool & The Gang amongst many others. During the summer of 1974, under the tutelage of HB Barnum, The New Creation entered the Devonshire Recording Studio’s in North Hollywood to lay down the basic tracks of the above two songs with HB later adding the horn arrangements. The group pressed 2000 copies (plus a later 500) on their own Salaam label. They initially began to seek out radio airplay, unfortunately this wasn’t to be to forthcoming as the majority of radio stations considered “The Fish Song” to have been recorded as a commercial song, (which the group had no intention of) and demanded spot fees for it’s promotion. Leaving The New Creation with no option but to promote their own product which they did through mail order and live appearances throughout Los Angeles, Chicago, Denver (Colorado), Cleveland and New York, selling their 45, for $5 each complete with a homemade promotional brochure. With the groups growing popularity, came the need for more travel and late night rehearsals which sometimes lasted till three in the morning, the teenage members were pulled from the group as their parents feared this would compound upon their High School work. The older members of The New Creation continued to perform locally supported by a host of local musicians, by and large performing cover versions throughout the 80’s. This lasted until 1992 when the group dissolved following the tragic murder of Robert Randle (Rasheed Shakoor Sr), a case of wrong place, wrong time, while assisting workers on a construction site he was struck by a stray bullet fired by a gunman involved in a nearby dispute. Melvin Houston along with cousins, Rasheed Shakoor Jr and Nadirah Shakoor later form another group known initially as Black Velvet which in turn became Black Velvet & Satin Soul at the request of the groups two female singers, Nadirah Shakoor and Siedah Garrett. Black Velvet & Satin Soul a top 40 tribute band which broke up without making any recordings, allowing members to persue other career options. With Melvin Houston persuing a career in the Aerospace Industry, Rasheed went on to tour with Tina Marie and later Milli Vanilli. As for the girl singers they went onto bigger and better things with Nadirah Shkoor later becoming a member of the Hip Hop group Arrested Development before going on to be member of Jimmy Buffet’s tropically themed music Coral Reefer’s Band, a position she has held for over 20 years. While Siedah Garret’s career has lead her to sing backing vocals with an impressive list of legendary recording artists the likes of The Pointer Sisters, Michael Jackson, Quincy Jones, Donna Summer, Madonna, Jennifer Hudson and El Chicano amongst many others, still finding time for her own solo career as a performer and songwriter. 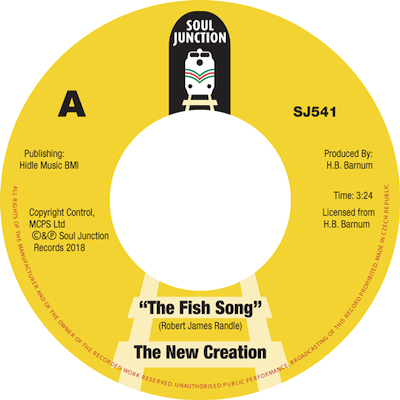 The New Creation’s “The Fish Song/Elijah Knows” is now a highly regarded and sought after 45 with Sweet Soul and Group Harmony collector’s in Europe and it’s native USA. With acknowledgments to: Melvin Houston, HB Barnum, Neville Griffiths and Dave Thorley.